Whilst we will do everything in our power to oblige your delivery request, below are some guidelines for you. We offer Standard and Express delivery within Sydney Metro area. Your order must be placed by 9.30am for same day delivery. Your delivery will usually be made between 12.30 and 7pm. If to a business address, within business hours. Your order must be placed by 1pm, this may mean the delivery is made outside business hours. In some cases, depending on the product ordered and delivery destination, same day ‘standard’ delivery can still be achieved. Should you want your delivery to be made as soon as possible, without paying for express delivery, please note this in the ‘Special Instructions’ field when placing your order. However if time is a factor, PLEASE phone us and discuss it at the time order is placed. These time frames do not include day of ordering, unless it is stated as ‘same day’ and your order is placed prior to 9.30am. Longer distance deliveries (Country NSW / Interstate) need to be placed by 12.30pm to catch our long distance couriers for pick up that day. For further information, please see our Terms and Conditions, located bottom of Web Page. The exception is Mother’s Day weekend, or should Valentine’s Day fall on a weekend. Country or remote area orders may take a little longer to arrive so please make allowances for this. lf there is no one home and we have access to a place we consider appropriate, we will leave the delivery in a shaded position in an area of reasonable visibility. If we do not consider it safe to leave at the home, we will attempt to leave with a neighbour. Although this rarely happens, if we cannot find a place we consider appropriate, we will return the delivery to our premises and contact the sender. If we are supplied with an insufficient or incorrect delivery address, your delivery will be re-directed to the correct address or returned to us. Incorrect addressing is the responsibility of the purchaser. Couriers do charge for redirection or re-delivery. Whilst we would love to offer our services to overseas destinations, we have found the cost, time delays, and in some cases quarantine regulations prevent us from sending from Australia. 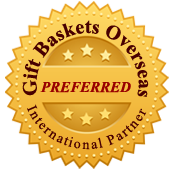 Should you wish to order to go overseas, we are happy to arrange this for you through Interflora. Interflora now has a lovely selection of Hampers to choose from which can be delivered to most countries within a reasonable time frame (normally within 48hours) Please phone us, and we will be more than happy to arrange this for you. Phone: 02 88503418 or 02 9899 9841. Please note that while every effort is made to deliver directly to the recipient, due to Retirement Village, Nursing Homes and Hospital procedure, we may be required to leave the delivery at the main office and staff will take to the recipient. It is our policy, if possible, to phone ahead when delivering to secure addresses. The reason we do this, as when delivering to these premises, if there is no one home, we are unable gain access to leave the delivery, which then in turn incurs delays and extra costs. If you know the address you are sending to is a secured premise, please mention this in special instructions. SECURE APARTMENT BUILDINGS are multi tenant or owner buildings with automatic access doors. The owners of these units use a remote control device to open the gates to the car park, or an access code to use the main access door from the footpath. These buildings almost always have an intercom that alerts the occupant that someone is at the door. SECURE GATED COMMUNITIES are multi-tenant or owner units or villas with an automatic access gate. The owners use a remote control device or access code to open the gate to the community. These community living systems always have an intercom system that allows access by dialing the villa number. SECURE HOUSES / BUILDINGS are buildings with automatic gates. The owners of these houses use a remote control device to open the gates to enter the property. These fence/gate systems always have an intercom that alerts the occupant that someone is at the gate. This is an extremely busy time for couriers. Longer distance (Interstate / Country Areas from Sydney) may take a little longer to get to their destination than normal. For deliveries within Sydney CBD and Metro areas of Sydney, your order should ideally be placed by 23rd December to ensure delivery before Christmas. For Interstate deliveries please allow extra time on top of our normal guidelines. Send a Basket will dispatch your order in a time frame to arrive at it’s destination for your preferred delivery date, however once it leaves our premises, any unforeseen delivery delays after leaving us, are beyond our control.